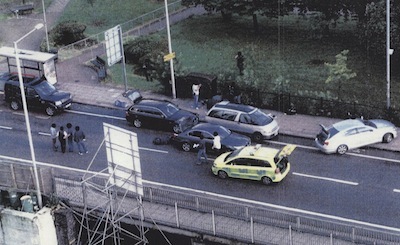 Photo of the scene of the shooting of Mark Duggan as submitted as evidence to the inquest. Inquests ought be open, public, processes for learning about how and why someone died so we can try and prevent something similar happening again. One thing which has struck me from the currently ongoing inquest into the death of Mark Duggan, who was shot by the police in London on the 4th of August 2011, is gaps in the information being provided by the police witnesses. A key issue for the inquest is what the police knew, and when, so the question of if things could have been done differently can be considered. The police are however claiming that much of the information they acted on cannot be provided to the inquest. Police witnesses say they were prevented by law from writing some of the information down, which means now, years on, it’s hard to reconstruct who knew what, when. I am intrigued and astonished by this and would like to know which law it is that the police think prevents them from writing things down. As well as material which the police say the law prevented them writing down at all there is other information which there is a written record of, but which isn’t being provided to the inquest. The information in this latter class is redacted from documents and replaced with a “gisted” version providing the gist of what has been removed. Communications intercepts – details of the content of phone calls, emails, texts etc. Geographical tracking of subjects, perhaps via their mobile phones, or via CCTV and ANPR. Information provided by members of the public who might be put at risk if it became know they were informing the police. I suspect the police, and the then Serious Organised Crime Agency (whose role has been taken on by the new National Crime Agency), are protecting their methods and capabilities so that criminals are not aware of how law enforcement agencies are able to gather information on what they are up to. I think that, to a degree is desirable, but we need to know enough about what is being done so that in this case we can review what happened, and in other cases, so we can ensure there is appropriate oversight, regulation, and public support for what is being done. The unknown unknowns make it very hard for the inquest to do its job. How can recommendations for making the relevant police and law enforcement agency practices safer be made if details of those practices are not being shared? What if the key problem was getting tracking information showing the location of key individuals (or their phones or vehicles) to the police officers on the ground? I’d like to see more reasons for redaction, and information not being available, given so that the acting coroner, inquest jury and the wider public can assess if important information is being kept from the inquest or not. The acting coroner is in a strong position to request information he considers is necessary for the inquest to fulfil its function be made available. Q : One of the difficulties is this, is it: that you were not allowed to write down the intelligence? Q. So you are working from your memory now? Just on that, you mentioned yesterday that there are sensitivities in being able to write down intelligence. By operation of law you are not allowed, in certain circumstances, to make reference to intelligence that you receive. Q. On this occasion, did you nevertheless make a note but we are not allowed to see it? Q. Can I just ask you about the way logs deal with intelligence? We’ve seen various versions of documents called day books, note books, whatever you like, in which people have, if I may say so, a very coy reference to intelligence, because they are not supposed to write that intelligence down in available documents; is that fair? Q. Was there any provision in August 2011 for you to have sensitive books so that if you had to write intelligence down somewhere you could do it and keep it locked away? A. The type of intelligence that we were dealing with we were not allowed to record it. Q. Was that a Metropolitan Police standard operating policy that you were not allowed to record it? A. I think it’s legislation. Q. Are you allowed to write intelligence in this sort of log? A. It depends on where the intelligence comes from, but generally don’t write intelligence of a sensitive nature in there. Q. Do you write sensitive intelligence down anywhere else? A. No. Because we are restricted by legislation from doing so. Q. Just so the jury can get some idea of the surrounding circumstances of the sensitivity here, how securely was this log kept? A. This log was kept in my office at — in a secure building where I worked. Q. Under lock and key? A. Yes, under lock and key. Q. So unless you were prevented by law from writing something in there, you could trust the confidential nature of what you wrote down, could you? Now, between 31 July 2011 and 4 August, was all the intelligence being fed to you for this four-day operation fed from SOCA or was there any other outside agency? This suggests the material was not from the intelligence services, but I suppose it could be information obtained by GCHQ then provided to the police via SOCA. The gathering, sharing and storing of this information and intelligence by us is governed by legislation, the criminal justice system and strict internal safeguards to ensure all information is secure. A SOCA lawyer is present in the inquest ready to interject if questioning approaches information which SOCA doesn’t think ought to be released. Q. Have you all met to decide that, as a matter of response in this Inquest, you are all going to say that Ferry Lane is the best possible place you have ever known for a stop? this question came after a number of police witnesses had said the same thing, in very similar words. The inquest transcript from the 1st of October, on p132, reveals that neither the Serious Organised Crime Agency (SOCA) or the Police had easy access to the address details for someone on licence being supervised by the probation service. The witness says a phone call would need to be made to the probation service to find out what address the individual told the probation service he was living at, or what address he was released from prison to. I find this an astonishing omission from the police and SOCA databases; and it appears to reveal the probation service’s databases are disconnected from those of the police and SOCA. I hope now this problem has been highlighted by the inquest it will be resolved. I think the police ought to be able to rapidly find the address of someone who is on licence from prison; I would expect that information to either be held on a police database or for the police to have direct access to the information held by the probation service. Sgt Wragg of Cambridgeshire Police reported to Cambridge’s North Area Committee on the 18th of December 2014 that at least in respect of Cambridge’s burglars the prison and probation service do proactively notify the police of when people are being released and what address they are being released to.